The type of fencing that you choose for your house plays a huge role in two major aspects of your home, the exterior beauty and security. Fencing helps you keep away many things including intruders, stray animals and also criminals in general. It all depends on the type of fencing that you choose for your home. There are a few fencing ideas that cost differently but also play different roles in your home. It would be wise to study your neighborhood so you can decide on the best fencing method to use. Aluminum fencing might sound classic and secure as compared to some other forms of fencing. The bars are very strong which makes it very cheap on maintenance. They might be a little expensive initially during installation because a specialist is needed. You need a welding expert and also painting would be required during installation. Though it doesn’t offer much privacy, the aluminum bars never require much maintenance all through its lifetime. When looking for security, privacy, cost-efficient, beauty and durability, Trex fencing would be the best option. Trex does not rot or get damaged from any weather effects so it reduces the cost of maintenance to a very affordable amount if need be. Trex offers perfect privacy as the interlocking pickets never leave any spaces between them when fitted well. They look like a continuous wall from one end to the other. A Trex fence looks great with any house! With vertical, horizontal, and fence post options and a variety of colors, you can build the perfect fence for your home. When you worry about the cost of installing a fence, but you also like to get beauty on top of it, then the wood fence would be your option here. This is the most common fence as it is cheap to maintain and it is very attractive too. With wood, you can choose the best height, design, color or even the type of wood to use. A nice hardwood fence done well could last for a very long time and add value to a house just like a nicely done hardwood floor. This fence blends well with a nice finishing of a house. The fence has to be made in a fancy way which is never cheap to the owners. These fences are beautiful but still very expensive to maintain as they normally require to be sanded and repainted after a few years. Since wrought iron fences are normally customized according to the owner’s preferences, this makes them very expensive to install. They also require an expert so that to get it done well. If you can afford it, why don’t you get your wrought iron fence done in the same design as your house and also use the same color of paint on both of them too? This way, you attract lots of attention in your neighborhood as not many houses would look the same as yours. 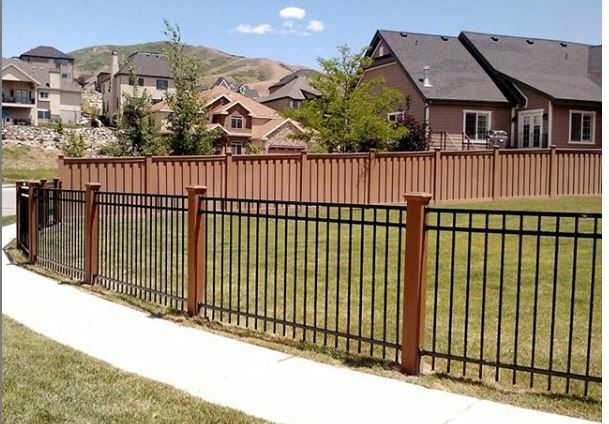 These are also a common type of fence in many places such as schools and homes. These offer fair enough security to the owners both from stray animals and intruders. As long as the chain link isn’t damaged in any part, it is almost intruder and animal proof all around. What it does not do well is privacy. Everyone can see right through them unless the owner decides to get a little creative in search of privacy. Grow some plants and let their vines intertwine through the wires creating privacy. You might as well try putting up some iron sheets in the chain link to try and create that privacy. The chain link fences are cheap to maintain especially if fitted well and strongly. Many people would focus on cost, privacy, and durability when looking to fit a fence for their homes. This is the main reason for it, but also getting a little creative with it still wouldn’t hurt at all. Beauty matters a lot as this would be the first place anyone would first come into contact with when they look at your home. Try and go round your fence once in a while so you can see damages or required repairs on your fence.